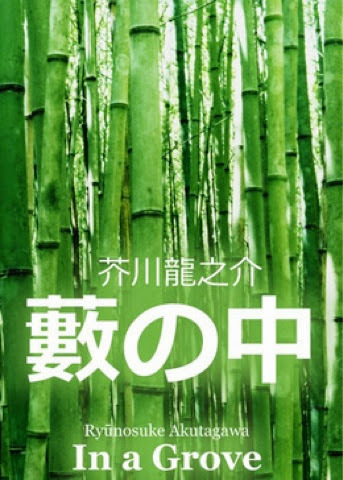 This fascinating story is the account of a samurai’s murder given to a high police commissioner from the perspective of a woodcutter, a traveling Buddhist priest, a policeman, an old woman, the man’s wife, and the murdered man himself (through a medium). As you read, you think that the story will become clear; each person’s revelation should surely uncover the truth about what was found in the grove. Except each person’s testimony only confuses the story further. With every account the blame shifts, the details change, the culprit becomes someone entirely new, until by the end of the story we have less clarity than when we began. “What happened is the truth for you,” she replied. And thus I became aware that there is no such thing as an absolute truth. I think that this is what Akutagawa is pointing at. As humans we have little ability to see clearly. To see objectively. To even see from another person’s perspective. We see with our own limited vision, often with blinders on, and asking for the truth becomes an impossibility. You can read the story for free, here. Next Post Thunday Thalon. A Thad Tale of What Uthed to be My Tooth. Sounds really interesting. I may have to go pick it up. Of course, it helps that it's free. I hope you can download it from the site as I did on my kindle. It's nice when the material is free, isn't it? So welcome, and not only is it a good story, and free, it's only about fourteen pages. Bellezza, thank you for the link! It sounds quite intriguing! I hope you have a chance to read it , Suko, not only for the JLC8 but for great literature. Akutagawa is known as the father of the Japanese short story, by the way. This one comes from the early 1920s. I'm often surprised to find many of the books or stories I want to read free online. It never hurts to do a search. Grabbing it right now. I haven't been reading as many stories or essays lately as I would love to. I need to read them more often! Short stories are a genre I rarely read because I like to get I to the meat of a book; 800 pages are nothing to me when a book is excellent. However, like you I feel the need to read them more often. They can make a powerful statement in just a few pages. This one ended, and it really had to think about it. At first, I felt slighted and just left hanging. Most intriguing. As I read your post, the Japanese film Rashomon came to mind. So I went on to IMDb to check, yes, of course! The film Rashomon directed by the renowned Akira Kurosawa is based on Ryûnosuke Akutagawa's short story. And not only that, there are quite a few films based on R.A.'s short works, and in 2011, a movie is even based on this same book, with the same title In A Grove. Impressed by the influence of this Japanese writer. Yes, mainly I think because he had brought forth the idea of different points of views in looking at the same event. Thanks for writing about it, Bellezza. I was going to mention Rashomon but Arti beat me to it. You mention the point from the story being that what is true differs from one point of view to another. In the movie the point was that everyone lies to make themself look better which is a much darker statement. Even the dead man lied to make himself look better. It might be fun to revisit the movie and read the story together. Sounds like an interesting approach to a story – and one that was effectively done in this case. I'm glad you've included the Japanese writers in your short story roster. I need to learn more about them and their works. P.S. I love that picture with the bamboo. Beautiful! I don't know enough about him, yet, to know if he consistently uses different points of view toward viewing the same event. But, that's something to look for. And, trust you, Arti, to find the film Rashomon! That's the next story of Akutagawa's I want to read. I suppose you could say that each person why trying to make himself/herself look better in the story, too. That didn't immediately jump out at me, but I should reread it to check for that. I was just so flummoxed to come to end with each person's testimony and that's all. There was no wrapping up of the story whatsoever, which as we know, is so Japanese. I'm so glad to be combining Japanese literature with your short story event, Jay. It is a wonderful way to increase my knowledge in both genres. This sounds so good! I've seen the film Rashomon but have never read the source material that inspired it. I will have to rectify that. Thanks so much for a lovely write-up!